Summary: Learn how to use Windows PowerShell to find all user profiles on a computer, and to display the date when each profile was last used. Hey, Scripting Guy! I would like to find a good way to see which profiles exist on my laptop. I found a Hey, Scripting Guy! post to do this, but it uses VBScript. Can this be done using Windows PowerShell? The registry location viewed in the Registry Editor appears in the following figure. Now that I have a listing of the profiles on the machine, I need to expand a couple of properties, such as ProfileImagePath and Sid. 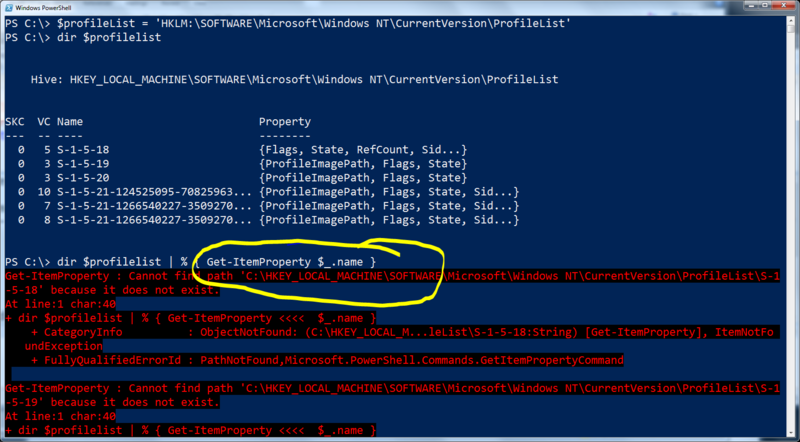 This should be a simple matter of using the Get-ItemProperty cmdlet to retrieve the name property from the list above. When I do this, however, an error arises. The command and associated error are shown here. There are actually two problems going on here. The first is that what is displayed under the Name column in the default output from the Get-Childitem cmdlet is not the actual value stored in the actual name property. 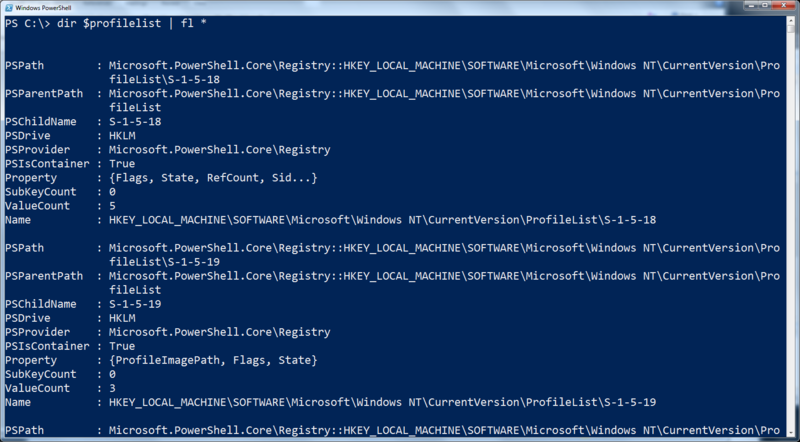 The second problem is that even if that were fixed, the value HKEY_LOCAL_MACHINE that the name property contains as part of the value is not the name of the Windows PowerShell drive used by the Get-ItemProperty cmdlet. I discovered this by piping the results of the Get-ChildItem command to the Format-List cmdlet (fl is an alias for Format-List) and analyzing the output. The following figure illustrates this process. CW, that is all there is to finding profiles on a computer. Join me tomorrow for more cool Windows PowerShell stuff.